On August 8th 2018, the Human Rights Foundation of Monland (HURFOM) interviewed Mi A— of Pa Nga village, Thanbyuzayat Township, Mon State. Her land was repeatedly confiscated by Burma Army Artillery Battalion No. 315 between 2004 and 2008. “Three or four years ago, we were struggling to get our land back. We filed a report many times. But we never had a chance to meet with any authorities. 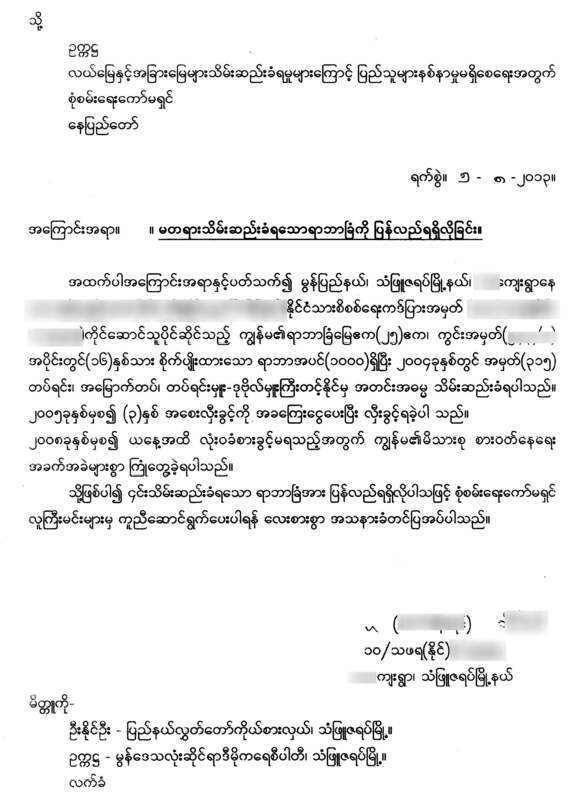 At that time, we filed a report to the [Mon State] parliament. Via the parliament, our report would go to the National Land Resource Management Central Committee. But the commission never contacted us. Our voices faded as time went by. “Our plantation has more than 1,000 rubber plants. The plants were ready to produce latex, but we could only do rubber tapping for just two or three years. After the confiscation, we were allowed to work on our plantation, but we had to pay tax for each rubber plants [to the military]. After working [like this] for two or three years, the army totally confiscated our land. We had no access to our plantation. “Our whole family had relied on the plantation. We were very happy to have such a plantation. We had made our livelihood on the plantation. We were in trouble after losing our land to the military. We requested help from many departments and organizations, but it was useless. “Last year, we all decided to make another attempt. But we realized there was no chance to get our land back so our hope faded away. We surely want our land back. If the military decided to give back the land, we will accept the land even if we have to pay money for the rubber plants that have additionally been planted by others. “As we lost our plantation, we run a small shop to make our living. We also have a small hillside plantation. We’re in trouble and we have to struggle a lot for our living. We can do nothing as we are doomed. “Later we daren’t touch the land nearby the army base. I learned our lesson, so we’ll never buy land nearby the army again. We learned a harsh lesson. They confiscated our land and sold it to others. When seeing that, we suffered a lot. It’s difficult for us to see other people working in our plantation. “Soon after the plantations were confiscated, every farmer was active to file a report and fight for their land. Now, no one speaks out about the confiscation as they realized there is no chance of getting the land back. It’s difficult to organize the farmers. Even when meeting each other, we don’t talk about the land confiscation. We act as if nothing happened. According to the report, Mi A— has lost 25 acres of land and 1,000 rubber plants to Lieutenant Colonel Tint Nyne of Burma Army Artillery Battalion No. 315 in 2004. She was allowed to work on her plantation from 2005 to 2008 after paying tax to the military. However, after 2008, the army totally confiscated her plantation and she has no access to her plantation at all.